A marriage by licence took place on August 23 1802 at the parish church in Talgarth, Breconshire between John Thomas (c.1775-1845) and Catherine Prosser (1776-1860), he being a Yeoman. The wedding was witnessed by Wm Webb and Jonathan Parry (presumably a churchwarden as he witnessed numerous Talgarth marriages). Catherine signed while John made his mark. John Thomas of Oakfield was buried at Llanfihangel Talyllyn on January 31 1845 aged 70. Catherine was buried on May 15 1860 aged 84. In the 1851 census her birthplace is given as Llangorse. John Thomas' ancestry has not been identified but the 1841 census shows him as being born in the county (Breconshire). Catherine's parents William Prosser (c. 1737-1817) and Phoebe Davies (c. 1742-1826, baptised to David Davies and Mary ? December 8 1745) were married at Llanigon on February 15 1769. (Phoebe had witnessed a marriage there of a Mary Davies to a James Price on January 20 1769). William Prosser was buried in Glasbury on October 5 1817 aged 80 while Phoebe was buried in Talgarth on November 19 1826 aged 84. See Prosser family of Talgarth for more about William and Phoebe Prosser and their other descendants. Sarah Thomas (1805- ?) married Thomas Powell ( - ?) at Talyllyn on March 5 1832 witnessed by Mary Hinckley, John Thomas (by mark) and Rees Rees (probably churchwarden). Arthur John Thomas (1854- 22 December 1928), a County Court Bailiff. Arthur John Thomas married elementary school teacher Mary Maude Williams (1856-1939, born Merthyr Tydfil). THOMAS. At Pengam, on April 11th, Mary Maude, aged 84, beloved mother of Maude Skey, Bessie Watkins, Tudor Thomas, Lena Tapper, and Trevor Thomas, and widow of the late Arthur Thomas, Bank House, Llangorse. Interment Llanfihangel Talyllyn Friday, 2.45 p.m. Friends please meet at Church. (Western Mail, 13 April 1939). Arthur James Thomas (1878- ). With parents in censuses up to 1901. Not mentioned in his mother's funeral notice in 1939. Maude Isabel Thomas (1881-1975) who married William James Skey (1881-1926, born Llanfihangel Talyllyn, died Pengam, Blackwood, Gwent). They had Bessie Evelyn May Skey (March 24 1907-1991) and Cuthbert Arthur James Skey (1911-1972). Bessie was born in Llanfihangel Talyllyn and died with her address as 3 Coombe Lea, Grand Ave, Hove, East Sussex. She married Frederick G Davies and subsequently Francis Ernest Andrews (February 3 1891-1982, born St Pancras). They were both at 122 Connaught Street, Paddington in 1939 when she was described as a single 'gowns saleswoman' and he was a single bank manager. The wedding took place very quietly in London on Saturday of Mr. Francis Ernest Andrews, son of the late Mr. and Mrs. Ernest John Andrews, of Meols, Cheshire, and Miss Beti Skey, daughter of the late Mr. James Skey and of Mrs. Maude Skey, of Pengam, Glamorgan. Mr. Andrews, one of the London managers of the Chase National Bank of the city of New York, is a prominent figure in British banking circles. His bride, who is a well-known London designer of clothes and hats, was educated at St. David's Convent, Brecon, and University College, Cardiff. She belongs to one of the oldest families in Breconshire. Her mother formerly lived at Oakfield, Llangorse, Llanfihangel-Talyllyn, near Brecon, which has been in the family ownership since 1670. Miss skey's cousins still live there. Her father died of wounds in the last War. Miss Skey wore a blue mauve dress, orchid taffeta sash, orchid velvet hat, trimmed with ocelot fur, and carried a bag and muff of ocelot fur. She had a mauve orchid bouquet. A reception was held at the Savoy Hotel. The bride's brother, Capt. Cuthbert Skey, who, at 27, is one of the youngest commanders in the merchant navy, was unable to attend. A motor-car, a diamond bracelet, and a diamond eternity ring was the bridegroom's gift to the bride, who presented her bridegroom with a gold cigarette case inscribed with the badge of his old regiment - the Sherwood Foresters - in which he was a captain before being taken prisoner in the last War. Elizabeth Rachel Thomas (1883- ). In the 1911 census as Elizabeth Rose. She married Jenkin Watkins (1876-1949), and emigrated to the USA in 1911. He was an Episcopalian minister. They had daughters in Ohio: Mary Christine Watkins (1913- ); Elizabeth B Watkins (1915- ) who married Joseph A Driscoll (1913- ) in 1939. Tudor John Thomas (24 March 1888- 22 March 1979, died Ystrad Mynach Hospital, Glamorgan), married Annie Maud Prestwood (14 March 1891- , born Tonypandy). Lena May Joan Thomas (1894- 27 December 1982, died Garway, Hereford and Worcester). She married William J Tapper (1892- ). Trevor Cyril Thomas (12 September 18976- 9 February 1989, died Llanfihangel Talyllyn). 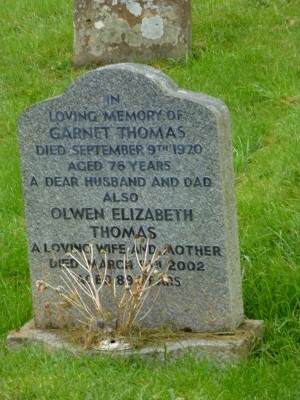 He married Gwladys A Lewis (1897- ) and had children including Arthur G Thomas (28 August 1924- ). Thomas Thomas (1810-1884). A marriage took place on October 27 1848 at the parish church in Llanfihangel Talyllyn between Thomas Thomas (1810-1884) and Ann Parry (1826-1902) both of full age, bachelor and spinster and of Oakfield 'in this parish'. He was described as a farmer, as was his father John Thomas and Ann's father John Parry's occupation was labourer. The marriage was witnessed by Catherine Stephens and William Stephens. Thomas signed whereas Ann made her mark. Catherine was probably Thomas' sister. An Ann Parry was baptised on December 21 1826 to John and Mary Parry of Hiddol, possibly John Parry (1799-?) and Mary Pugh of Llangors who married in 1825. That John Parry may have been the son of John Parry who married a Margaret Hergest (?1766- ?) in Llangors in 1799 (Powys Banns). John Thomas (1850- ). With parents at Oakfield 1851-1881 censuses. He married Elizabeth Davies (1857 - ?) c.1887 and was farming in the Bwlch area in subsequent censuses. They had: Mary Thomas (1888- ); William G Thomas (December 4 1888 - ) who married Margaret Evans (March 29 1897- ) and had children, including Jean M Thomas (May 27 1928-) and John H Thomas (April 10-1930); Elizabeth Thomas (1891- ); and Thomas Thomas (1894- ). Rosa Madia Chandler (1878- ) married John Thomas Jones (c.1880- ) on July 10 1905 at Llanddewi'r Cwm, Builth, Breconshire. They were at 7 Garth Road, Trealaw, Rhondda in 1911, having had one deceased child. Leonard Odessa Chandler (1879- 22 January 1950). A drapers assistant, boarding in Ashby de la Zouche, Leicestershire in 1901. Probably married Elizabeth Barnes in Nottingham, Sep Q 1913. Died in Nottingham. They had Leonard Eric Chandler (1916- , married Hilda Pownall) and Kenneth Norman Chandler (16 May 1920- Nov 2006, died Rhondda, Glamorgan). Leonard senior's probate was granted to Leonard Eric Chandler electrician and Kenneth Norman Chandler university lecturer. Laura Adeline Chandler (1882- ). She was a cook domestic living with her parents in 1911. Arnold Thomas Chandler (1889-1961) married Mary A Bufton in 1917 and had Reginald T Chandler (1918- ) and Dilys M Chandler (1920- , married William M Mason in Whitehaven, Cumbria in 1949). Brecon and Radnor Express January 3 1918 - The marriage took place at Llanelwedd Church, on Boxing Day, of Mr Arnold Thomas Chandler, younger son of Mr and Mrs E. D. Chandler, Bryn-y-haul. Builth Wells, and Miss Mary Anne Bufton, eldest daughter of Mr A. Bufton, Werncoe, Llanelwedd. Rev. D. Lewis Davies (rector) officiated. The bride was given away by her father, Mr W. Beavan (Builth) was best man, and Miss Rachel Bufton (sister fo the bride) acted as bridesmaid. Both bride and bridegroom received numerous useful presents. The happy couple left by the mid-day train for their new home in Whitehaven. Rosa Madia Thomas (1855-1935) who married Thomas James Price (1855-1913). See the family of Tom James Price and Rosa Madia Thomas. Rosa Madia was apparently named after an Italian Protestant (wife of Francesco Madiai). The couple had been imprisoned in Florence for their beliefs in 1851. This case caused outrage in Protestant Europe and had extensive coverage in the British press. Joseph Thomas, Oakfield, Llanfihangel, Talyllyn, Breconshire, was on Monday, found with a gunshot wound in the stomach, by his wife. She tried to get him to speak to her. but in vain. The body was warm, and she sent to Brecon for medical assistance, but the doctor, upon arrival, found that life was extinct. On Monday the dead body of Mr Joseph Thomas, farmer, of Oakfield, Llanfihangel Talyllyn, was found in a barn a short distance from his residence with a gun shot wound in the side near the heart, and lying in a pool of blood. There was a double-barrelled gun about a yard from the body, which had been loaded with one cartridge and had been fired. The discovery was made by the deceased's wife, who had gone to milk the cows in a cowshed which adjoins the barn. The body was removed to deceased's house. Dr. Cooper, assistant to Dr. D. V. Kees, was soon on the spot, but undoubtedly life was extinct before the body was discovered. &Deceased kept the gun in the barn, and was in the habit of using it for scaring crows. He had been suffering from depression of spirits for some time. He left his residence about 8.30 in tho morning for the purpose ostensibly of going round the farm, and about half an hour afterwards tho discovery was made. No report of a gun being discharged had been heard by anyone. Deceased, who was 48 years of age, leaves a widow and a large family of young children. At Oaktield Farm Llanfihange Talyllyn, Breconshire. on Tuesday, Mr M F. Thomas (coroner) held an inquest. touching tho death of Mr Joseph Thomas (48). who was discovered on the prievious.day shot dead in a barn about 300 yards from his residence, Oakfield farm House. Mrs Annie Thomas, wife of the deceased, deposed that he went out after breakfast, at about 8-45 on Monday morning, stating he was going to see the sheep. At about 9 o'clock she went out to milk the cows, which were in the beast house adjoining the barn. When she got to the fold the barn door was open, and she could see her husband lying down on the floor of the barn with his gun near him. She called him but got no answer, and upon going in and making a closer inspection she could see he was dead. She ran to the house and sent her daughter for neighbours to come to her assistance. Deceased kept the gun in the barn and was in the habit of using it for shooting at the crows on the wheatfield. He had been using the gun for that purpose quite lately. Deceased had not been in very good spirits. He had not been worrying of late, but he had had a certain amount of worry over money matters some time back. By the Coroner: Nobody had been pressing him for money duiing the past month. To her knowledge deceased never threatened to commit suicide, and had not, alluded to anyone who was trying to take his farm from him. He left no note in his pocket. Mr Griffith Jones, Tycanol. a. neighbouring farmer, deposed that when he got to the barn deceased was lying on his left side with his legs crossed, and a gun within a yard of him. the stock of the gun being toward his feet. He knew deceased had had pecuniary troubles lately, but he did not appear to be much depressed when witness saw him last on Friday night. Police-constable William Dew said that when he turned deceased over he saw he was quite dead. He noticed a small hole in the front of the waistcoat, which was singed. He found another hole in the trousers and indications that the charge must have entered deceased's body at a very short range. There was blood inside the waist coat and a wound in deceased's stomach. The gun - a double-barrelled one - had one cartridge exploded. Under the body was a rake, and deceased's left hand was clenched a little arnund the handle of the rake. The gun was lying parallel to the body, and about a yard distant from it. Dr Francis William Cooper, assistant to Dr, D V Rees, Brecon, deposed that deceased had a conical shaped wound over the stomach, and the intestines were protruding It was a wound that could be produced by a gun shot at a foot or less range off. He did not think deceased could have lived more than ten minutes after receiving the wound. Oakfield Farm, Talyllyn, 40a. 3r. 2p., with grazing rights on Llangorse Common, rent £32 p.a., tithe £4 7s. 8d., timber £30 1s.-£875, the tenant (Mrs Annie Thomas). 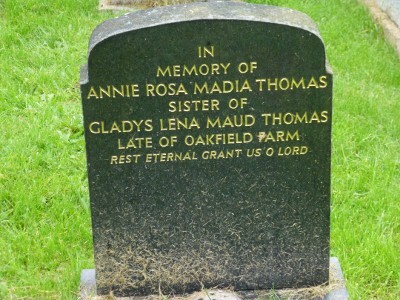 Annie Rosa Madia Thomas (Rosie) (3 September 1889- 5 February 1978). In the 1939 Register she is shown as farming on joint account at Oakfield with James G. Thomas and Gladys L. Thomas. Her address for probate was given as St David's Hospital, Brecon. Mr Garnet Thomas, Ashfield farm, Talyllyn appealed on his own behalf. The farm was 40 acres and he was the only man to manage it. He had a widowed mother and several brothers and sisters dependent upon him. The farm was stocked with 16 cattle and 3 horses, and 7 milking cows. His mother was an invalid. He had a brother, aged 15, who helped him on the farm. They had 20 acres of hay to harvest. The tribunal granted exemption to October 1st. Garnet Thomas, Oakfield, near Talyllyn, farm manager, aged 22 years, appealed against the refusal of the Brecon Rural Tribunal to grant him exemption. The Chairman: What Class is he in? The Secretary (Mr H F W Harries) Class A. The Chairman That is refreshing, (Laughter). Appelant's mother told the Military Representative she had five sons and none of them serving. No exemption, not to be called up till Aug. 1st. In the 1939 Register Garnet was at Penrhyl Cottage, a farm labourer. They had children, including Gwyn James G Thomas (13 February 1935-1985). Gwilym Thomas (11 November 1896-23 March 1963) married Mary Elizabeth Frost (4 February 1900-1992) in 1921. In the 1939 Register they were at 4 Windsor Road, Pontypridd, Glamorgan when Gwilym was a Telegraph Linesman, GWR. They had Gerald Thomas (1931-2013) and a daughter. James Gwyn Thomas (1901-1966) married Ellen Mary Finch (1909-1968) in 1941. Reginald Rhys Soar (24 August 1893-1971), known as Rhys, a World War 1 air ace who died in Martletwy, Narberth, Pembrokeshire. He had three partners: the first Kathleen Maud Richmond Lancaster (1893-1918) died when he was serving with No.255 Squadron at RAF Pembroke; the second was Laura Smith (1899-1964); the third was Lily Humphreys (21 July 1905-1980). He had a number of children, including Euan R Soar (14 July 1930-1946), Caroline A Soar (16 Sep 1931-1946), Rene Soar (2 Feb 1933-1999), Reginald Nigel Soar (1934-20 February 2013) born Wrexham, lived at Martletwy, Narberth, Pembrokeshire and died in Withybush Hospital, Haverfordwest. Cyril Ivor Soar (7 December 1894-1978). Married Ellen Breeze (6 April 1895-1978) in 1954. They died in Poulton-le-Fylde, Lancashire. Henry Soar (12 January 1896-1982), a Colliery Fireman in 1939. Married Jessie Smith (5 September 1900-1963). Margaret Ann Stephens (1842-1923) married shoemaker John Pritchard (1843-1908, born Llangasty Talyllyn) and had: Rosanah Pritchard (1864-), Margaret Pritchard (1866- ) both born Llansantfraid, Catherine Ann Pritchard (1869- ), Elizabeth Pritchard (1873- ), Sarah Jane Pritchard (1876- ), Walter Pritchard (1878- ) and Alice Pritchard (1881- ) in Llanelly, Breconshire. In 1901 Walter was the only one remaining with the parents, a mason aged 23. In the 1911 census, bilingual widow Margaret Ann Prichard (sic) was employed as a chapel caretaker at Ebenezer Cottage, Clydach, Abergavenny. She recorded that she had been married for 26 years (sic) and had 7 children of whom one had died. Helenah or Ellen Perkins (1880- ) born Nantyglo. Jane Perkins (1882- ) born Middlesbrough. In the 1911 census, widow Margaret indicated that she had 9 children of whom 7 were alive. John Perkins (1846- ). A baker in 1871. An unmarried labourer in 1881. Living with daughter Mary Perkins (1869- ) in 1891 and 1991. Evan Thomas (c.1820-). Shown on 1841 census with rounded down age of 20.